SteelSeries, the leading global manufacturer of gaming peripherals, in partnership with ArenaNet, the world’s premier developer of massively multiplayer online games (MMOs), today announced a new line-up of gaming peripherals for Guild Wars 2. Created in collaboration with ArenaNet, the line-up includes the Guild Wars 2® Gaming Headset, a slim profile, on-ear headset design that delivers a quality, immersive audio experience, and the Guild Wars 2® Gaming Mouse, an ambidextrous mouse that features seven programmable buttons, red illumination, and industry-leading technology. Both products are highlighted by the distinctive look of the Guild Wars 2 logo. The Guild Wars 2® QcK Mousepads are available in three designs, including the stylized dragon logo and the heroes Logan Thackeray and Eir Stegalkin. The Guild Wars 2® Gaming Keyboard rounds out the product line-up with an entirely new design that features SteelSeries Engine software for ease of use and advanced functionality as well as game-specific shortcuts; additional details about the keyboard will be unveiled later this year. The Guild Wars 2 Headset is a slim-profile, on-ear design featuring red ear cushions made of a mesh, SNDBlock material that delivers superbly engineered in-game sound via 40mm driver units. Its matte white headband and glossy white, red, and black logo design on the outer earcups exemplify the iconic Guild Wars 2 look and feel. Built for portability and ease of use, its travel-friendly design allows the earcups to fold inward and lay flat when wearing the headset around the neck; it also collapses at the earcup hangers for quick and compact storage. The headset includes a red 3.5mm PC cable connection with an in-line, omni-directional microphone and mute controls for gaming and online chat. For maximum flexibility, the Guild Wars 2 Headset also offers 2 input jacks – one on each side of the headset – which allows for two user options: to choose which side the microphone cable can be plugged into, and the ability to “daisy chain” or plug in another headset so that multiple users can listen to the game at once. The design aesthetics of the Guild Wars 2® Gaming Mouse were as important to the designers as the hardware features. Its rubberized soft-touch coating is hand-sweat resistant, which allows for exceptional grip and comfort during long battles. The dynamic white, red, and black dragon icon is synonymous with the game, evoking the artistry of the Guild Wars 2 in-game world. Red illumination and up to 4 different levels of pulsation options can be adjusted at the scroll wheel, CPI toggle light and the Guild Wars 2 logo for a custom user experience. With best-in-class hardware switches, a pro-grade laser sensor ranging up to 5,700 CPI, the Guild Wars 2 Mouse is designed to deliver players the best in gaming performance. Its ambidextrous, all-grip design includes 7 programmable buttons, all of which can be completely customized with SteelSeries Engine software. The software provides users with the ability to create macros and utilize pre-defined profiles for Guild Wars 2 as well as create and store an unlimited amount of profiles within the SteelSeries Engine. The Guild Wars 2 QcK Mousepads have non-slip rubber bases to keep from moving and optimized texture surfaces for a smooth and consistent glide. 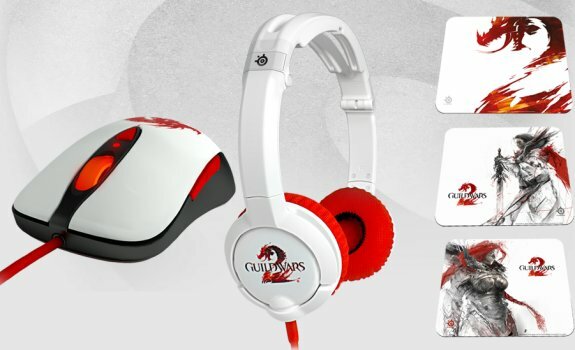 The SteelSeries QcK Guild Wars 2 Logo Edition features the red, white, and black dragon logo while the SteelSeries QcK Guild Wars 2 Logan Edition and the SteelSeries QcK Guild Wars 2 Eir Edition each feature an image of the iconic human guardian and norn ranger heroes from the game. The premium Guild Wars 2 branded keyboard will be released later this year. More details about the keyboard design as well as hardware and software features will be release closer to its availability.